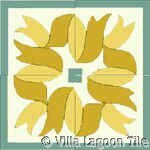 What is Tile Tessellation ? 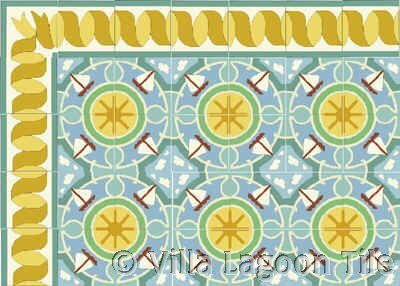 Traditional floors made of encaustic cement tiles are laid out like a carpet or rug and often have a coordinating border just as a Persian rug might. All of our tiles have interlocking patterns that are usually laid with each tile turned 90 degrees from the tile next to it. This creates a beautiful new pattern. Tessellation: A tessellation is created when a shape is repeated over and over again covering a plane without any gaps or overlaps. A dictionary may tell you that the word "tessellate" means to form or arrange small squares in a checkered or mosaic pattern. The word "tessellate" is derived from the Ionic version of the Greek word "tesseres," which in English means "four." The first tilings were made from square tiles. Another word for a tessellation is a tiling. 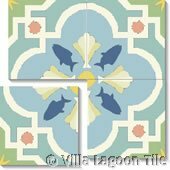 To tessellate is to create a tiled design on a flat surface using a repeated geometric pattern without overlapping or leaving empty spaces. Tessellate (verb), tessellation (noun): from Latin tessera "a square tablet" or "a die used for gambling." Latin tessera may have been borrowed from Greek tessares, meaning "four," since a square tile has four sides. The diminutive of tessera was tessella, a small, square piece of stone or a cubical tile used in mosaics. Since a mosaic extends over a given area without leaving any region uncovered, the geometric meaning of the word tessellate is "to cover the plane with a pattern in such a way as to leave no region uncovered." M.C. Escher is a Dutch artist whose tessellation drawings are largely based on recognizable images. He imaginatively turned geometric shapes into such creatures as birds, lizards, and fish. Most of his tessellation art was created from about 1937 - 1958. He did not consider himself a mathematician. In fact he had been a poor math student. His interest in tessellation art led him into the world of mathematics and he made significant contributions in both areas. For more about the life of M.C. Escher visit Wikipedia. Also see David Bailey's World of Tessellations for much interesting work on the subject. How Our Tiles Tessellate ! This Ribbon Border corner is designed so it can be used at the four corner of a rectangle, and also rotated 90 degrees to form an interesting square. And imagine, the Ribbon Border can also be laid in stripes all going the same direction as Villa Lagoon will have in the Powder Room.